Our weekly roundup of the world's literary news brings us to France, Singapore, and the United States. 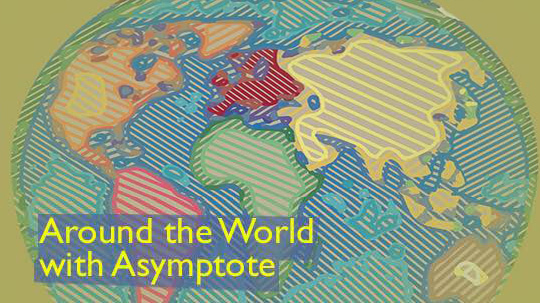 It’s Friday, which means it is time to catch up on the literary news from around the world, brought to you by our fabulous Asymptote team! This week, we highlight France, Singapore, and the United States. As previewed in our January dispatch, Paris is getting ready to host its annual Book Fair, starting March 16. The spotlight this year will be on contemporary Russian literature, with thirty-eight guests including Olga Slavnikova, Vladimir Charov, and Alexandre Sneguirev—all previous winners of the Russian Booker Prize. But even before the fair opens its literal doors, another event is organized in Southern France to satisfy those readers that can’t make it to Paris. Bron, a commune of Lyon, will hold its first Book Festival, dedicated entirely to contemporary fiction, between March 7 and 11. The festival celebrates those French authors who showcase the heterogeneous nature of the novel itself, with a spotlight on the works of Jean-Baptiste Andréa, Delphine Coulin, Pierre Ducrozet, Thomas Gunzig, and Monica Sabolo. March is also Women’s History Month and French publishers have joined in the effort to promote literature by women and on women. Folio, a Gallimard imprint, has launched its “Femmes Prodigieuses” (“Brilliant Women”—a play on Elena Ferrante’s “My Brilliant Friend”) campaign on social media, urging readers to read and share the works of their favourite women authors. Folio’s own suggested reading list include classics and contemporary authors, from Virginia Woolf to Marie NDiaye and Chimamanda Ngozi Adichie. Beyond just the campaign, publishers are celebrating Women’s History Month by simply publishing more women. Simone de Beauvoir’s memoir “L’age de discrétion” (“The Age of Discretion”), analysing womanhood at sixty and beyond, will be published for the first time as a standalone book. Albin Michel, another major publisher, will publish Susan Rubin Suleiman’s “La question Némirovsky,” a biography of Irène Némirovsky, of “Suite Française” fame, to paint a portrait of a great, and yet forgotten, author. This past month, we celebrated the forthcoming releases of two exciting new novels by Singapore-based writers. Asymptote contributor Amanda Lee Koe (who also recently won a prestigious PEN/Heim Translation Fund Grant) announced the acquisition of her hotly-anticipated debut Delayed Rays of a Star by American publisher Doubleday, while Clarissa Goenawan’s Rainbirds—winner of the 2015 Bath Novel Award, and previously acquired by US-based Soho Press—was picked up for Singapore publication by Math Paper Press. According to her agent, translation rights for Goenawan’s novel have already been sold in nine languages, including Hebrew, Greek, Indonesian, and Turkish. February also boasted a full calendar of literary events, from a Valentine’s Day poetry challenge organized by Poetry Festival Singapore in the run-up to its ‘Love at the Gallery’ readings on March 10, to a ‘Carnival of Poetry’ hosted by local non-profit Sing Lit Station which featured five Singaporean poets reading alongside eight Singapore-based migrant poets. At the same time, the ‘Huayi – Chinese Festival of the Arts’ kicked off with a range of theatrical and literary events, including discussions with a younger generation of Chinese-language writers and editors on their dynamic literary collective TrendLit, which has already established a fast-growing journal and anthology series. Most eye-opening, however, was ‘Out of Print’, an ambitious exhibition curated by poet Daryl Lim which saw sixteen classic works of Singapore literature given visual makeovers by graphic design firm Sarah and Schooling. The show, which launched at the end of February, was hosted by The Arts House (another non-profit) in conjunction with its upcoming ‘Textures’ festival—a weekend of performances, discussions, and film screenings focusing on the written word in Singapore. If the festival programme is anything to go by, the coming weeks promise just as many unmissable literary treats: join us if you’re in town! The latest installment of Us & Them, a PEN America Writer-Translator Reading Series, was held at the KGB Bar, New York City, February 11. This event was part of a series, organized in participation with the PEN Translation Committee, featuring writers who are also translators, reading both their own and translated work: Anne Ishii, translator of Gengoroh Tagame (Japanese); Madhu Kaza, translator of Vimala (Telugu); Taije Silverman, translator of Giovanni Pascoli (Italian); and Kyle Dacuyan, translator of Hervé Guibert (French). Mai Der Vang, Visiting Writer at the School of the Art Institute of Chicago, read her poems at the Poetry Foundation, Chicago, February 13. Der Vang is the author of Afterland. Lily Hoang and Jackie Wang celebrated the publication of their new books with a reading at the Poetry Center at San Francisco State University, March 1: Hoang’s A Bestiary, literary essays, and Wang’s Carceral Capitalism, political essays. Katrina Dodson, Aditi Machado, and Anna Moschovakis presented Writing Translation at the Poetry Project, in New York City on March 2. Dodson is the translator of Clarice Lispector’s Complete Stories, winner of the 2016 PEN Translation Prize. Machado, Poetry Editor at Asymptote, is the author of Some Beheadings and the translator of Farid Tali’s Prosopopoeia. Moschovakis, a member of the publishing collective Ugly Duckling Presse, is the author of They and We Will Get Into Trouble for This and You and Three Others Are Approaching a Lake, and her translations include books and texts by Annie Ernaux, Albert Cossery, Claude Cahun, Jean-Luc Nancy, Pierre Alféri, Samira Negrouche, and Robert Bresson.